Veterans Families United (VFU) is a all-volunteer organization dedicated to honoring our Veterans and their families while providing them with compassionate resources for healing. In October 2011, the VFU Board voted to designate 100% of all Memorial Funds to assist Veterans, Service Members, and their families with small one-time emergency transportation needs. These donations have been given on behalf of a loved one in remembrance or tribute. After WWI, Canadian Lt. Col. McCrae wrote the poem “In Flanders Field”. In the poem, poppies are scattered across the graves of the fallen, creating an image of patriotism, grief, mourning and resilience. The poem is written from the point of view of the dead and it speaks of their sacrifice and serves as their command to the living to press on. 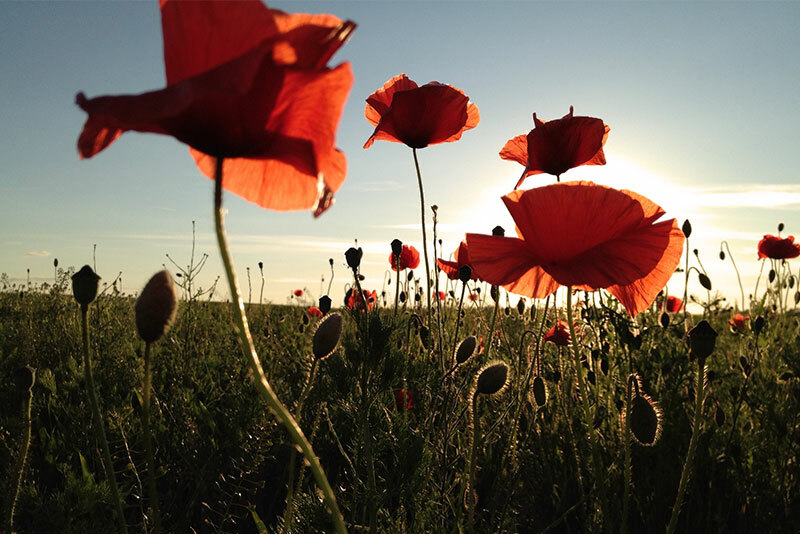 Since 1921, the poppy flower has been a recognized international symbol to remember the costs of war and those who paid a price and hope for new tomorrows. In memory of Mike Adrangna (1-11-10) from Gerald and Laurie Plummer. In loving memory of Tomas and his dedication to our country including two tours to Afghanistan in which he received the Bronze Star Medal, Purple Heart and Army Commendation Medal. Saddened by the loss of this young soldier, family and friends pay tribute to his courage, love and service and the many lives he touched. In memory from the White family, OR. In honor of Bert Bank, one of America’s finest Veterans and Patriots. In Honor of the memory of William H. Bledsoe, Louisville KY, a US Navy Veteran. In memory/honor of Ranger Major Thomas G. Bostick, Jr.
Col Robert Wayne Bradfield, Army from Boise, ID. In memory of SGT Casey T. Briggs, a true example of the Army values. He will always be remembered for both his honorable service, and what a great person he was. In Memory from Your Friends at Gotham Comedy Club and Gotham Comedy Live. In Memory of Commander Benjamin Harris Butler. Grayford served his country as a member of the US Navy in the Korean War on the USS Brinkley Bass. He extended his personal knowledge of service, being a veteran, and returning to civilian life by ministering to his grandson Joe as he struggled with the damaging and painful impacts of post-combat shock. But he didn’t stop there. This embracing outreach of comfort and resources extended to all veterans through his investment in Veterans Families United as a founding Board Member. He had a true heart of service and will be deeply missed. Thomas Aubrey Chesher served his country proudly in the US Army Air Corp in WWII. He continued his “service” to his country until his death in October of 2013. He was committed to his family and served as an inspiration to the eldest of 8 children, in setting a standard for integrity and for faithfully recognizing the tremendous gift of freedom. He was the oldest brother of Grayford Chesher, VFU founding Board member and great uncle of Joe Collins for whom this foundation began. He made a difference. In loving memory ~ From Linda A., Chris G. and Marybeth D.
In Memory of Delmer Dean, Oklahoma City, OK, US Marine Corp WWII Veteran, a man of great dignity and integrity and my hero (May, 2010). In memory of Joe Diaz who served in the US Navy and was a gunners mate third class and fought in the Normandy Invasion in WWII. He was loved by his family and had many friends, many of whom sent memorial tributes on his behalf. Joe was a true patriot and family man and will be missed by all who knew him. Veteran’s Day 2012 – In honor and memory of Philip T. Dukes. We are blessed for his years of service in the United States Marine Corps. and kind spirit. He will be remembered always. In loving memory of our dear brother, Charles R. Dusold, an Air Force Veteran, who was a joy and inspiration to all of us who loved him. He loved his country and had a special place in his heart for those who have served, and are currently serving our country. Loren Eugene Eller, US Navy from Bellevue, WA. In memory of Gerald J. Erickson, beloved father and friend. In honor of Mr. Robert Feather, USMC Sgt. who served 3 tours in Vietnam. In memory of Henry Gazdziak, US Army Veteran, Korean War. Rest In Peace. In loving memory of Mr. Thomas R. Hall III, Staff Army Sergeant on behalf of Creative Benefits, Inc., Newtown Square, PA. In loving memory of Walter Hammert, Jr., a founding VFU Board member since 2007 (along side his wife of 43 years, Dorothy). His presence will be missed, but his spirit of genuine, lifelong commitment to veterans and families will be with us always. Farewell, our dear friend. You have left a legacy that has touched many lives with your kindness and steadfast service. In memory of Sgt. Brandon Harris for his service to our country in Iraq and for the legacy he left through his loving family who continue to serve veterans as a life long tribute to him. In Memory of USAF MSGT (Ret.) Clifford Leon Higgs, Sr. A hero to his country, a gentle “Papa” to his family. In memory and gratitude for your service. In memory of Hollis, David. In Memory of Major William Philip Keselmeyer. In Memory of Norris Larry (Tiny) Lee 2-24-26 to 5-26-11, buried with Military Honors, Ft. Riley Cementary, Ft. Riley, KS. In memory of your service. In memory of Jake McNiece for leading 18 paratroopers behind enemy lines in a 36-day mission which helped to ensure the safety of his brothers-in-arms during the Normandy invasion. Jake then worked for the US postal service where he retired. His 93 years were full of “service” to others. In Memory of USMC Henry W. Mellen, WWII veteran, for his military service to our country and to his ongoing service to fellow veterans and families through this memorial. In memory of John Melott and to encourage family members to look for the warning signs of depression and PTSD and to intervene as much as they can. In loving memory of Abe Milstein who never forgot his patriotism, or love for his country. From Susan and Erick Reickert. In tribute to a lovely person and nice man. Nurse, Mary T. (February, 2014) – CT. In memory from the Schuster family. Nurse, Robert V. (January, 2014) – CT. In Memory of LTC Francis M. O’Kelly, M.D. (2010). In loving memory of Larilane Payne, Military One Source Coordinator for Central Oklahoma. Larilane was formerly in the military and used her knowledge and her heart of service to go far above and beyond the call of duty. She was an inspiration and gift to all who were blessed to cross her path. In Loving Memory of Bill Perkey, Royal Oak, MI: An Air Force Veteran. In memory of a veteran that lived a life a service; who never stopped learning or living life to its fullest and who loved his family deeply. His passion for embracing all of it will be carried forward through his legacy and love and by modeling the “celebration of life”. A wonderful father and friend who will be missed greatly. In loving memory of Edward O. Rockwell, Sr. (Plum, Pa) whose life was an example of kindness, integrity, honor and selfless service. In Loving Memory of Mr. Karl R. Sandmann, Wilmington, MA whose family, friends and community (Maine, Massachusetts) sent an outpouring of donations in his honor; a testament of Mr. Sandmann’s impact on the lives of others and his desire to carry that forward to veterans and their families. In memory of Richard L. Schilling who served the the US Navy on the USS Vesole DDR-878 (on behalf of this veteran from the Molina’s). In loving memory from his son Mark and family on behalf of a man who was beloved for his wisdom, his playful wit and humor and was admired and trusted for his wise counsel and his ability to handle any task with composure and competence. His life was an example to all, well-lived in service to God, family and country. In memory of Murray Siegel from Alex D. Wender and Frank Kron. In loving memory of Carl Slayton, US Army and for his loving, hard-working and gracious heart as he served our country, then in service as a Fire Dept. Captain and his devotion to all who knew and loved him. In loving memory of Lynn Stedman, a humble servant of the Army National Guard for over 30 years and a man whose life was dedicated to the principles of freedom through his connection with family, faith and community. In memory of Josh Stern who died on Oct. 15, 2010 a soldier who had just returned from his second tour of duty in Iraq and in deep awareness that casualties of war are often invisible. On October 10, 2010, Chuck Sullivan, an Air Force veteran, passed away at the age of 77. He served our great nation from 1951 to 1959. Mr. Sullivan not only loved his country, but he had a special place in his heart for those who have served and are currently serving in our military. Mr. Sullivan was blessed with 55 years of marriage to his wife, and he was a loving father, grandfather and great grandfather. His family sincerely appreciates the many people who donated to Veterans’ Families United Foundation in his honor and memory. In Memory of Nils A Thornberg Jr, Airforce. A loving husband, father, pa, and much more. In memory of a beloved husband, father, and grandfathers, this donation was made in his memory and on behalf of his love for his daughter, son-in-law and grandson. In grateful memory of his service. In memory of Col. Thomas Walsh, a WWII, Korea and Vietnam Veteran. Tom was an inspiration to so many people. He served his country with distinction and those who knew him felt blessed and proud as he left the world a much better place. In memory of Harold Williamson and his pride and service in our country from the Animal Medical Center of Calhoun Co., Anniston, AL. In Memory of Russell Wolfe and his passion to serve veterans – a quiet hero. In memory of TSgt. Robert R. Woodyard, USAF and in honor of his daughter and her lifetime commitment to hope and healing, Cathy Woodyard Bray. In loving memory of Dr. Nelda Ferguson, wife of WWII KIA, whose life was devoted to serving others. She understood service and sacrifice and committed her adult life, until the age of 86, to advocated for those in need by offering her services, support and encouragement. In loving memory of Velma Johnston and her steadfast support of veterans and their families. In loving memory of a daughter, sister, aunt and friend who was dearly loved by her family. In loving memory of Margaret Pattee and her lifelong support of those who have served our country and on behalf of the many who loved her. In memory of Loretta Shultz and in honor of her late husband, Edward Schultz, USAF. In gratitude and honor of Zachary Williams, OEF and OIF veteran who earned a Purple Heart for his courage and service. Over the years, Margaret contributed to our veterans’ cause, as she too, was married to a veteran who served our country. This was a cause that was deeply close to her heart, as was giving back to families in need (from her daughter Sherry). In honor of the family of Connie Fox Moore, founding VFU Board Member, and the mightly little Oakes (her grandchild) who was a little warrior that fought a valient battle during his one year of life. Little Oakes and his family exemplified the power of family, friends, Faith and how loving support sustains us through difficult times. Make a monetary donation by clicking on the PayPal donation button or by mailing a donation to our P.O. Box listed. For additional help, please email us with any questions or concerns. Tell us your story. If you are donating with PayPal, simply send us an email about your donation and share with us the name and any special information you would like added to the tribute. If you are mailing the donation, please include a note with the same requested information. You will be sent a receipt and the family or individual will be notified of your tribute. Donations may be made via PayPal or by simply mailing a monetary donation to our P.O. Box. For our Memorial and Tribute Donations, please follow the instructions to complete your donation.